It Revolution Press, 9781942788713, 240pp. The Business-IT Wall Must Come Down With A Seat at the Table, thought leader Mark Schwartz pulled out a chair for CIOs at the C-suite table. Now Mark brings his unique perspective and experience to business leaders looking to lead their company into the digital age by harnessing the expertise and innovation that is already under their roof: IT. In the war for business supremacy, Schwartz shows we must throw out the old management models and stereotypes that pit suits against nerds. Instead, business leaders of today can foster a space of collaboration and shared mission, a space that puts technologists and business people on the same team. 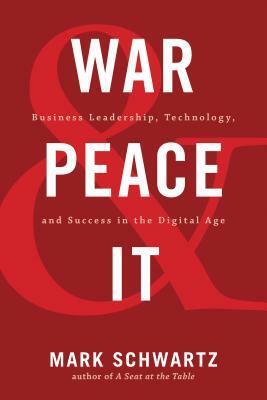 For business leaders looking to unlock their enterprise's digital transformation, War and Peace and IT provides clear context and strategies. Schwartz demystifies the role IT plays in the modern enterprise, allowing business leaders to create new strategies for the new digital battleground. It is time to change not only the enterprise's relationship with technology, but its relationship with technologists. To accelerate, enterprises must bring technology to the heart of their work, for just as technology is causing this disruption, it is technology that provides the solution. Unlike Napoleon, it is time for business leaders to come down from the hill atop the Battle of Borodino and enter the fray with the technologists, for that is where the war will be won or lost. Mark Schwartz is an iconoclast, former CIO, and a playful crafter of ideas, an inveterate purveyor of lucubratory prose. He has been an IT leader in organizations small and large, public, private, and nonprofit. As an Enterprise Strategist for Amazon Web Services, he uses his extensive CIO wisdom to advise the world's largest companies on the obvious: time to move to the cloud, guys. As the CIO of US Citizenship and Immigration Services, he provoked the federal government into adopting Agile and DevOps practices. He is pretty sure that when he was the CIO of Intrax Cultural Exchange he was the first person ever to use business intelligence and supply chain analytics to place au pairs with the right host families. Mark speaks frequently on innovation, change leadership, bureaucratic implications of DevOps, and using Agile practices in low-trust environments. With a BS in computer science from Yale, a master's in philosophy from Yale, and an MBA from Wharton, Mark is either an expert on the business value of IT or just confused and much poorer.Mark is the author of The Art of Business Value, A Seat at the Table, and War and Peace and IT and the winner of a Computerworld Premier 100 award, an Amazon Elite 100 award, a Federal Computer Week Fed 100 award, and a CIO Magazine CIO 100 award. He lives in Boston, Massachusetts.